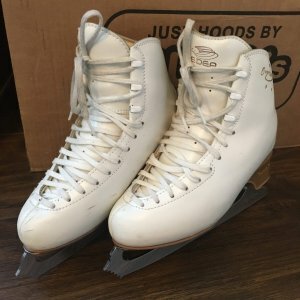 When my daughter started skating, I bought her a cheap pair of beginner skates which set me back around £60 and the LTS course was £48 for a 6 week course. Before skating, she rode horses which is an expensive sport so I remember thinking that skating was comparatively good value! How little did I know …. Group Learn to Skate lessons cost around £10 per lesson (half an hour) but a private coach will cost in the region of £20-25 for the same time. Some coaches may cost considerably more than this especially as your skater moves up the ranks and needs more specialist coaching. But before you start thinking that’s not *too* bad, consider this. If your skater starts competing, they’re likely to need at least a couple of half hour lessons per week, higher level skaters may have up to 5 hours of lessons per week. They may also need more than one coach eg a specialist jumps or spins coach and then a general skills & choreography coach. Some skaters take off ice classes too – flexibility, core strength, jumps and stretch classes are all common. Costs for these can be around £5 for a group class but up to £40/hr for private tuition. A gym membership may also be beneficial (£15-30 per month) although there are exercises and work that they can do at home without the need for a gym membership. On top of the lesson costs, you’ll need to pay the rink to use the ice. Prices depend on whether the ice is reserved for training purposes which is typically called ‘Patch Ice’ and often has restrictions on use eg can only be used once you’re over a certain level. Some rinks have different levels of Patch Ice eg up to Level 3, Level 3-6, over level 6. Other ice sessions are usually called ‘Public’ sessions which means that anyone can use them including the general public who have never skated before. Depending on how busy these are can affect how beneficial your training / lesson is so consider checking out the ice before booking a regular lesson. 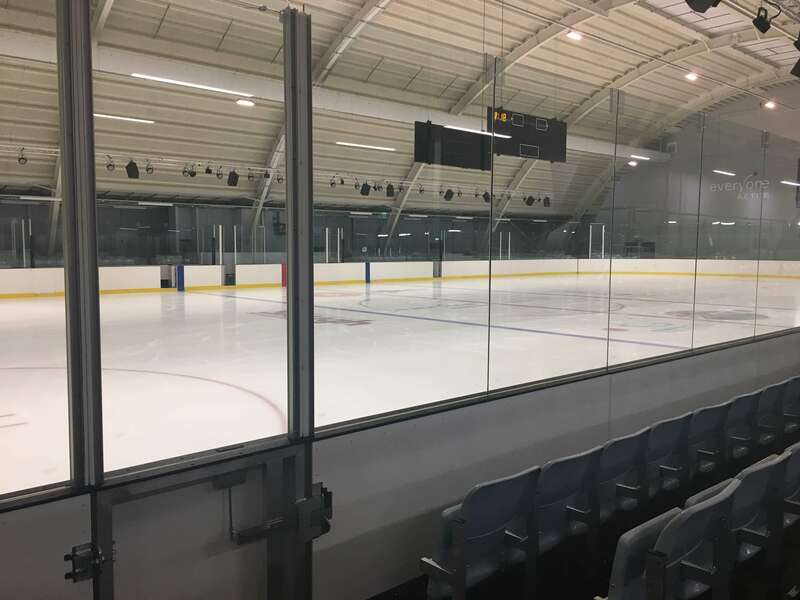 Many rinks have monthly subscriptions for ice time which can reduce costs considerably if you’re training regularly but pay as you go costs are in the £5-15 per session region. Basic boots will set you back £50-100 but these are really only suitable for Learn to Skate courses. Intermediate boots are around £120-220 – some come with the factory blades, some are boot only. Advanced boots start at £250 upwards and the sky really is the limit as you’ll need to consider factors such as what type of jumps they’re doing (and therefore what stress is put on the boots) but a good skate shop will be able to advise you on which boots are suitable. If your child is young and growing fast then boots are going to be a big expense as they will likely grow out of them before the boots are worn out. Want a copy of our Skating Kit Lists? Ever wondered what you really need in your kit bag for practice and competition? Pop your email in below and we’ll add you to our mailing list. In the first email you’ll get a copy of our Practice and Competition Kit Lists completely free! You may want to change the factory fitted blades for different ones, especially if you’re focusing on Ice Dance only. John Wilson Coronation Ace blades are a popular choice and run at around £120-150 a pair. And then of course they’ll need regular sharpening (how regular depends on how often you skate and how hard you work the edges but every 6 weeks is fairly normal) which costs around £8-10 per sharpen. Once they complete the Learn to Skate programme, your skater may want to join a skating club. Prices vary dramatically depending on the type of club for example, at my rink, the Skating Club costs around £35 per month while the Synchronised Skating Club costs £80 per month. Other clubs costs will vary depending on how much ice time is allocated to the club and how frequently they’re training. Some clubs also run off ice classes, personal training, nutrition, ballet and more which obviously all contribute to an increased cost. Once they’re skating regularly, they’ll almost certainly start pestering you for specific training clothing. To be fair, these items get a LOT of use and so are overall good value but on the surface of it, can seem pricey. Bear in mind that they’re designed specifically with skating in mind so leggings for example will be shaped to fit over the skate, may be fleece lined for warmth and may have moisture wicking properties (great to prevent sweat and they dry quickly if you fall over or need to turn around a quick overnight wash!). Leggings start at around £40 up to £95 per pair. Jackets start at around £45 up to around £95. I’d definitely recommend getting at least one pair of leggings as these will get worn the most. Some skaters wear sweatshirts or hoodies to skate in but these don’t have the breathability of skating specific jackets and so they’ll get hot and sweaty quickly in them. Some skaters prefer a practice dress or skirt, especially the younger girls. These cost from around £12-40 for skirts and £40-70 for a practice dress but there are plenty of second hand options on eBay and Facebook Skating Groups so take a look at those to start with. For tests, the girls will need a plain dark (usually black) ‘test’ dress. Boys will need plain black trousers and a plain tshirt / skating shirt. Prices vary wildly on these – starting at around £40 upwards. For competitions, you’ll need a dress / costume for each routine (free skaters usually have 1 routine until they get to higher levels and then have 2 routines) but ice dancers will have 2 pattern dances plus a free dance to perform and typically will have a different dress for each routine. Again prices vary wildly depending on how custom the design is. You can pick up competition dresses off the shelf for around £100 but custom dresses will usually start at around £150 plain or £200 with some stones – the more complex the design / the more crystals added, the higher the price. 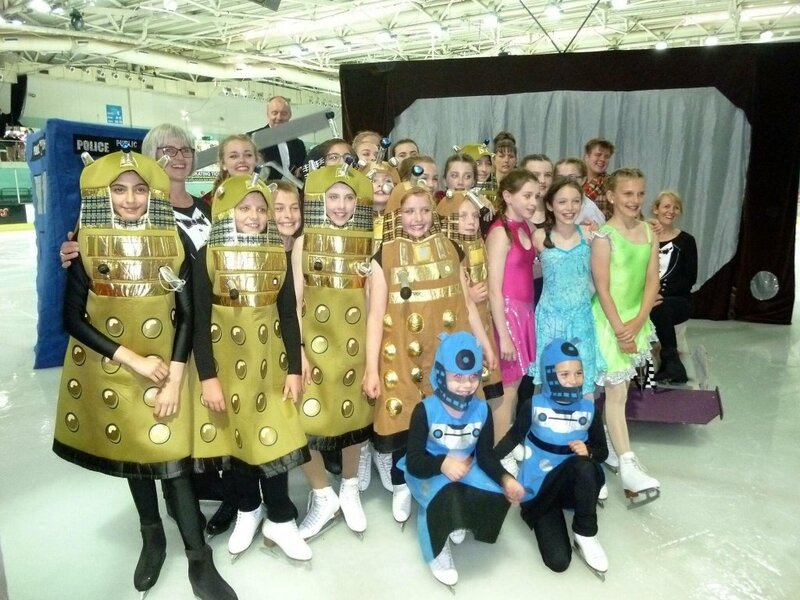 Higher level domestic skaters are spending £400—1000 per dress on their costumes. This cost may increase as they start competing internationally and Olympic level skaters spend around £5000-8000 per dress! Tights are essential when wearing skirts or dresses whether that’s for practice or competition. Buy tights intended for skating – they’re expensive but worth is as they’re thicker and harder wearing than dance or fashion tights. Typically £12-25 per pair. Skating mum tip – in the boot or footed tights last longer than over-the-boot tights so go for those unless the coach has a specific requirement for over the boot tights. Almost all skaters will have a skate bag and the bag of choice in the skating community is generally a Zuca bag – basically a trolley on wheels that can be filled and pulled along but also can be used as a seat (very welcome at some competitions!). 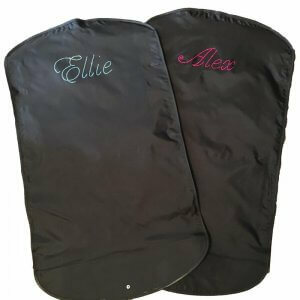 They have many pockets and sections and lots of choice of colours and bag designs to allow a skater to express themselves but at approx £140 are not a cheap option! They’re not an essential item though and some skaters will use a general sports holdall or a cheaper over-the-shoulder skate bag (around £20) or even a small wheely suitcase to store their skates and items. Water Bottles: if they’re training hard, they’ll need a lot of water. 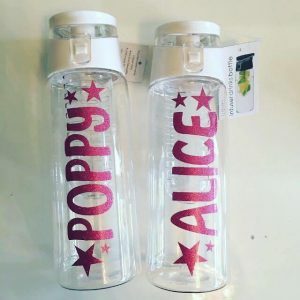 A personalised water bottle will ensure they’re drinking enough and their bottle doesn’t go missing. Soakies: soft guards with a towelling lining used to protect the blades in storage and soak any moisture away preventing rust on the blades. Hair Accessories: they’ll almost certainly need an unending supply of donut rings, hair bobbles and hair grips, especially if they’re competing. Skate Tape: Also known as hockey tape, this is a clear tape which is wrapped around the ankle portion of the skate preventing the laces from coming undone but which doesn’t damage the leather boot when removed. Don’t be tempted to use sellotape! Approx £2-3 per roll. Now that your skater is taking it more seriously, they’re going to start testing (ie taking skating exams) and competitions. In order to do this they need to be a National Ice Skating Association (NISA) member which currently costs £55 for under 18’s and £62 for adults. 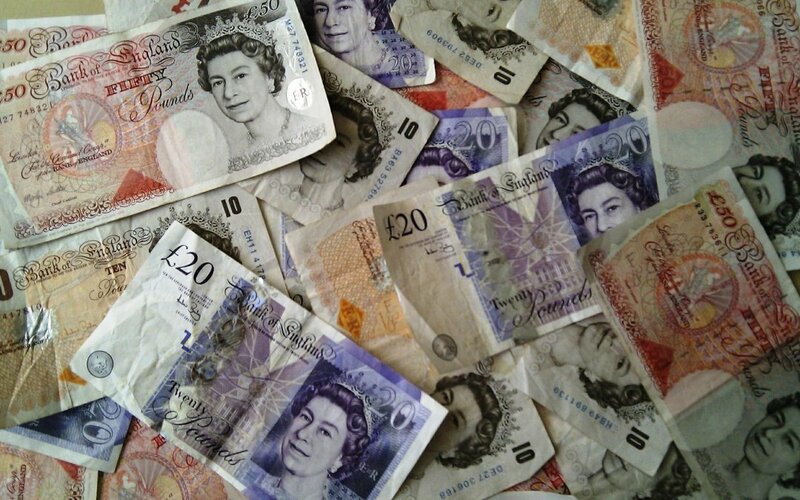 Test fees start at £21 per test and get more expensive as they go for higher levels. In addition to the test fee, you’ll also need to pay the rink for test ice time (typically around £5 per test) and your coaches fee (varies per coach but often £10-15 per test). For competitions, test fees start at £73 per event but don’t forget all the incidentals that go with competing – travel costs, hotel bills, food at/during the event, competition photo’s and memorabilia which can all add up especially if you’re travelling abroad. You’ll usually require your coach to go with you and so you’ll also need to cover their travel and accommodation costs as well as their fee for attending the competition and missing out on their normal coaching earnings. Most coaches will have a capped day rate and you may be able to share the cost with other pupils of the same coach which helps keep the cost down. Be aware that many competitions require you to have a coach to put your skater on the ice, they can’t just get on the ice themselves or have one of their friends or older skaters standing at the gate, so coach costs can be a significant expense. Some coaches will put other coaches pupils on the ice – at my rink, the coaches will often ‘share’ the responsibility if another coach can’t make it to the competition or if its not financially viable for them or the skater but this is not always the case and shouldn’t be assumed to be the case. Bear in mind that your skater will gain confidence and comfort from having their own coach at the competition with them – they know their routine, how they skate, what their weaknesses are and how to calm them down, so having your own coach can be a huge boost. Want a copy of my Skating Kit Lists? Dont forget if u are spending serious money then yr child will be competing too. That means entry fees for each segment entered (1,2 or 3 segments). Plus travelling costs i.e. petrol, accommodation , food etc. Dont forget test fees to get to levels required and, if your child becomes very good then training camps at home and abroad plus international competitions. I think the costs must vary tremendously depending on where you are. I’m skating in two rinks, 4-6 times a week, have 2.5 hours of private lessons and additional off ice/ballet and don’t pay anything like that amount! My most expensive coach is £18 for half an hour. Competing costs a lot, but that’s more due to the travel and accommodation costs so I have to limit myself to one national and one overseas one per year. That’s generally easy enough as I don’t have the amount of time off work to allow more!